A view of Bridgnorth in Shropshire, showing barrels and crates being loaded onto barges by the bridge. A hill town, Bridgnorth was built on a high sandstone ridge rising from the bank of the River Severn. The town prospered during the 18th century because of its cap and hat-making industry and river trade. 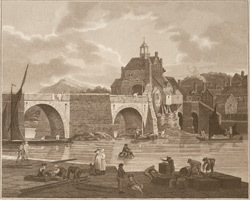 The bridge in the picture was replaced in 1823.